Phil Godenschwager has a career spanning more than 40 years. From a graphic design degree and a vague interest in stained glass work, his career has taken him through a variety of media including print design, glass restoration, mural painting, art direction for an international animatronics company, private commissions, and more recently, large public art projects. 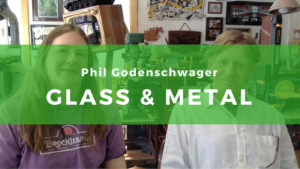 Phil studied for a time at the Pilchuck Glass School in Washington, and he is also a member of the Glass Art Society. View other posts on working with glass.